The easiest way to install various Unix tools and open source software onto OS X is via a package manager or repository, unfortunately OS X doesn’t come with one, but fortunately there are some good folks that care. They come in the form of Homebrew. Homebrew isn’t the only option, also available is MacPorts and Fink but Homebrew is the newest and easiest of the trio. Mac OSX 10.10 Yosemite Guide here. 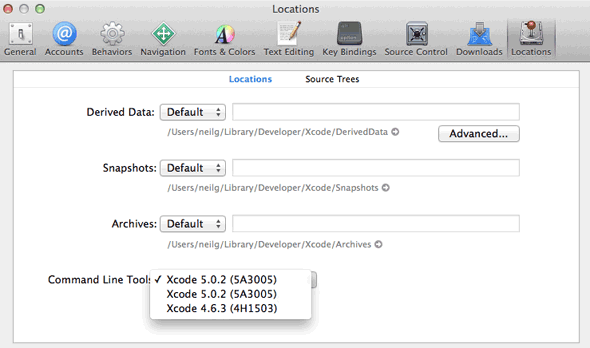 Get Xcode 5.0.2 from the Apple app store, free download version. Download and install it, you also need to open Xcode agree to the license and it will install its components. Go to Xcode preferences and then look in the ‘Locations‘ tab, select the latest Command Line Tools and then install them.